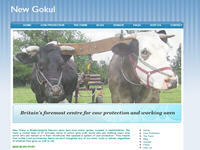 The official website of New Gokul, Bhaktivedanta Manor’s dairy farm and visitor centre, located in Hertfordshire. It is Britain’s foremost centre for cow protection and working oxen. Category Farm Communities July 2, 2012 by ISKCON Desire Tree.